So, I followed the paving stone path on into Center School last Friday evening where I was treated to the fantastic 5th grade production of The Wizard of Oz. There were two significant challenges to photographing this event. First, there were very few lights on the actors for much of the production, which made it quite difficult to get clear pictures. And second, there is no air conditioning in Center School which resulted in some very hot and uncomfortable actors, audience members, and photographers. Seats by windows in the gymnasium were at a premium because the outside air provided some relief from the heat and humidity. I found that there was lots more light near the back of the stage than there was up front so I ended up shooting some from backstage and from the wings to try and get some clear shots. This had the added advantage to putting me close to a few windows and open doors and the extra ventilation they provided(here I discovered a few of the more clever kids also trying to escape the heat while they waited for their next scene). I was pretty happy with some of the pictures I got of the performance and I hope that the participants find the gallery enjoyable. Here are a few of the highlights along with a link to the extensive gallery of the production and the after party. Please don't pull the mane. It's real! My favorite picture of the evening. The curtain call began before everyone was ready. It was delightful to see the all-smiles cast scramble for their places. Bravo! 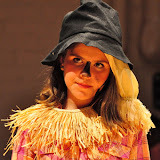 Categories: "Children", "Elementary School", "Old Lyme", "School Play", "Theater"